The weather on a day like this can be deceiving. You may see rain and the roads may appear wet, but there still could be spots that are icy. Also the ice will take time to thaw a few hours after the temps warm above 32ºF. It is going to take time to shovel, scrape, and clear off of your car this morning. Plenty of ice and snow, even if it looks like rain. But the plain rain appears to be south of Baltimore to Annapolis and Washington. School Delays: Many schools called for a delay. 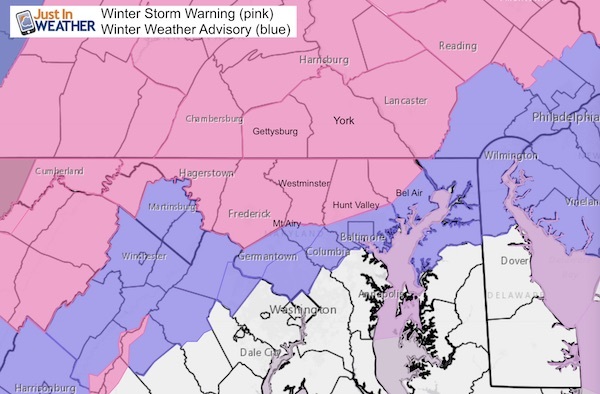 Harford County MD was first to close and I expect more will follow in similar locations that closed Monday. It’s best to wait and reevaluate each hour. Basically, keep checking as the thaw will be gradual. We all will get rain that could be heavy this evening to wash a lot away. There are two more winter events on the horizon that might need to be factored in with the schedule. Saturday could bring snow, and more snow and ice mix next Tuesday. See those maps below. 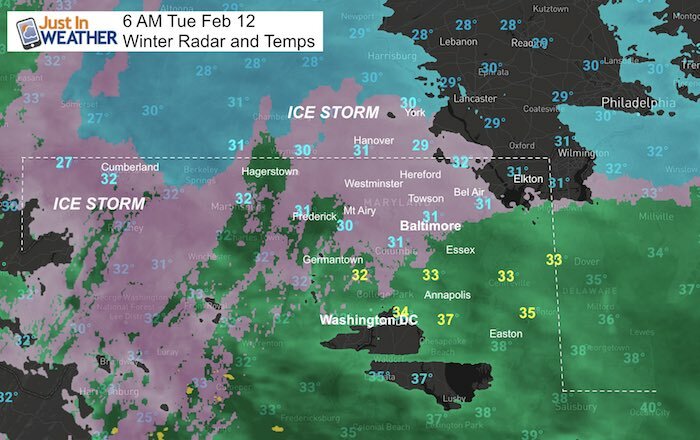 I have seen a range of 4 to 7 inches in the colder zones north of Baltimore in northern Harford, Baltimore, Carroll, and Frederick Counties, into Southern PA. Meanwhile is mainly just wet south of Baltimore. Please share you measurements and photos on the social media post where you saw this link. 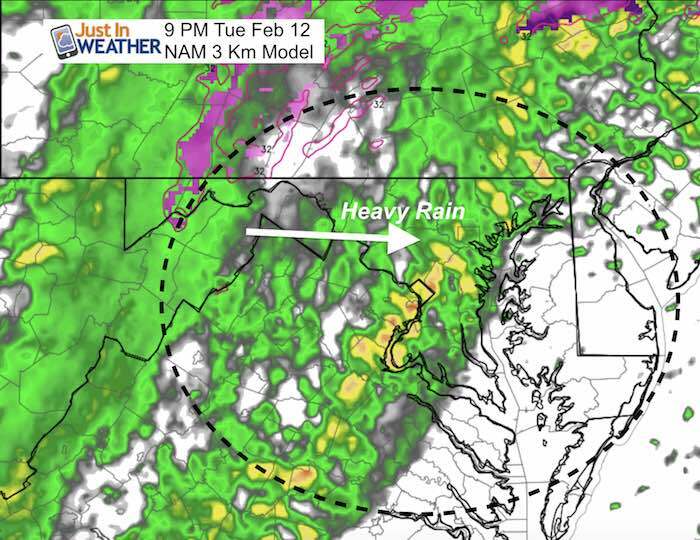 night) of 3 to 7 inches are expected, with isolated totals up to 9 inches possible along the Pennsylvania border in northern Baltimore and northwestern Harford Counties. Freezing rain accumulations of a tenth to a quarter of an inch are also expected through Tuesday morning. one half of an inch are expected. change the precipitation to plain rain during the mid afternoon. I think this is still holding up pretty well. The biggest impact will be snow and icing Monday night into Tuesday morning! Longer snow and ice impact northwest of the big cities. Nearby NW suburbs likely 2″ to 4″ snow is expected. That would be up to 1″ to 2″ of snow from each each round. Farther northwest encircled in white could get 5″+. That is potential, not a promise. That would be up to 2″ from round 1 AND 3″+ from round 2 before mixing to ice. Southern Pennsylvania: including Adams, York, and Lancaster Counties. At this point it looks like the bulk will pass on the southern part of our area. If the typical shift north applies, that keeps us in the bulls eye. 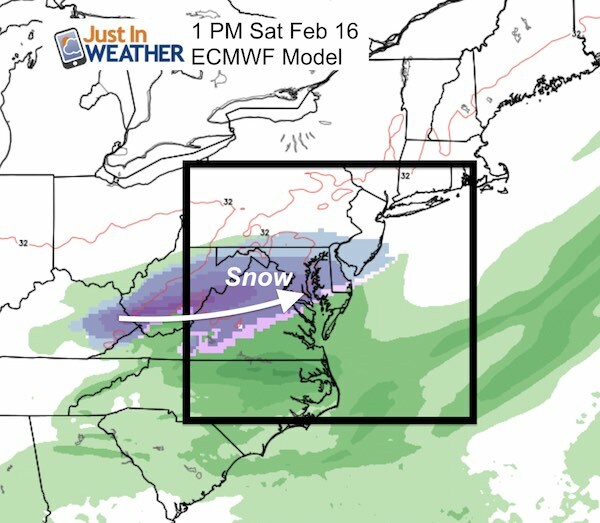 The next system looks like a classic icing event. 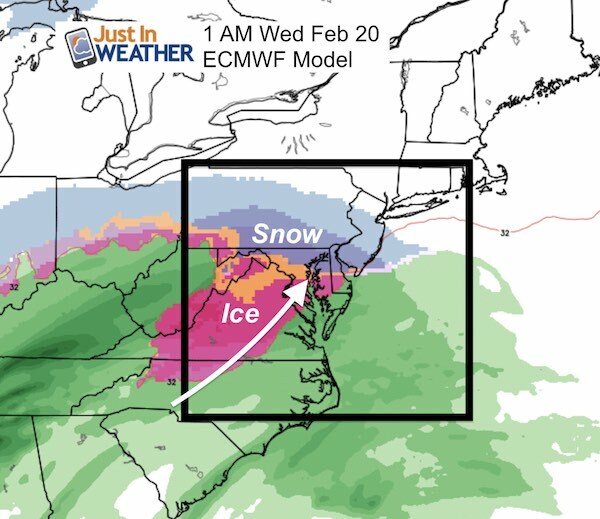 Again, this one is a week away, so there will be some wiggle room with the timing and track But snow mixing with ice is the way it looks for now. As we just saw, a wintry event can hit hard event when the outlook showed temps above freezing for afternoon highs. 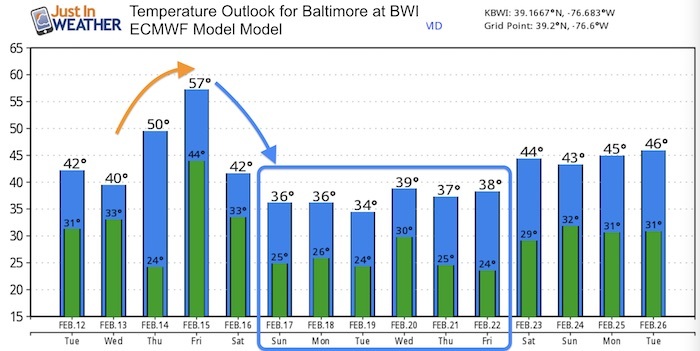 It looks like the trend will be in the 30s/below average next week.